Uzi won the title that’s eluded him for so long, and now, he’s headed to MSI for the first time. Jian “Uzi” Zi-hao might be the most popular player in the history of League of Legends. He’s the most iconic figure in China, the game’s most populous region. But he’s also been cursed. Through six long years, he’s never hoisted the LPL championship—until now. History was made when Royal Never Give Up and Uzi finally defeated longtime nemesis EDG to win the LPL championship. In doing so, they exorcised demons of the past—including a reverse sweep loss to EDG in last summer’s final—and redeemed Uzi in front of his home crowd. Here’s how history was made in the LPL. One of Uzi’s biggest problems in finals has been controlling his emotions. He’s always played emotionally, but getting tilted in pressure situations has set him back. EDG tried their best to tilt Uzi early. Uzi gave up the the series’ first kill on a gank by EDG jungler Ming “Clearlove” Kai. Taking advantage of RNG’s early-game comp, EDG won the first game to put even more pressure on RNG. But rather than fall apart, RNG rallied behind their ADC. 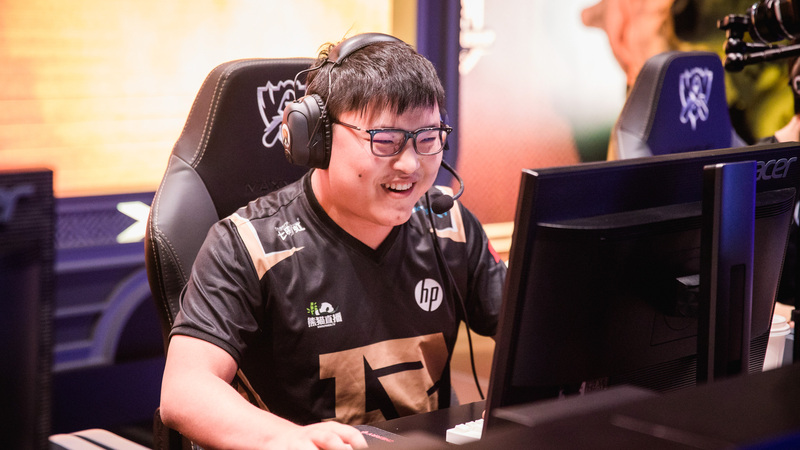 Mid laner Li “Xiaohu” Yuan-hao showed his stuff on a non-support champion, and jungler Liu “Mlxg” Shi-yu came off the bench in favor of Hung “Karsa” Hua-hsuan. That sub proved pivotal. Pulling out his signature Olaf in game two, Mlxg snowballed his bot lane ahead. RNG had nearly total map control as they steamrolled EDG. For a moment, it looked like RNG baited themselves in the third game after they banned Olaf and picked up Karma for Xiaohu. But despite EDG having longtime shot caller Ming “Clearlove” Kai back in at jungle, RNG were the ones making the better macro plays. They gave up pressure when appropriate to take things on the other sides of the map, and used minion waves to their advantage. And in the key fight around Baron, the theory behind the Karma came through. It looked desperate for RNG, having been poked out by Lee “Scout” Ye-chan’s Azir soldiers. But Xiaohu ran in like a madman, zoning off the EDG carries and giving Uzi an enormous shield to keep him alive. Just like that, RNG had tempo, and with it, the game. They took a 2-1 lead and put EDG on match point. The problem was, we’ve seen this before, and EDG had come back from bigger deficits against RNG. It all came down to one final game. One closeout game for Uzi to finally lift the championship trophy. One game to put the shame of last summer—and every one of those missed opportunities—to bed. In that last game, RNG showed why this year is so different. They rallied behind their embattled ADC, and as a team, carried each other past the finish line. Xiaohu had a dominant performance on Vladimir. Top laner Yan “Letme” Jun-Ze, much maligned for his performance in that doomed series last summer, held his own after getting subbed back. Mlxg stole the first Baron off a fantastic engage from his teammates. And in the key fights, Uzi did not falter. The casters mentioned afterwards how calm he looked, how in-control he was emotionally. It was the same calmness we noticed he carried all year, through interviews, games, and ultimately, through winning the LPL title. For the first time, Uzi lifted the LPL championship trophy before thousands of adoring fans. It’s the crowning achievement of his career, but at the same time, his career means so much more than one title. He’s the complete player he never was before, and deserves this moment in the limelight. With the win, RNG will head to Europe as the LPL’s representative at MSI. And those fans of other regions have to wonder: With the monkey off of Uzi’s back, could RNG win it all in Paris? We’ll definitely be glued to our screens to see what Royal can do next.